If you're invested in Sea of Thieves' ever-expanding lore, as chronicled in Tales from the Sea of Thieves and out there on the islands and tides, you may be interested to hear that the Tales are far from over. Nine Cat Nura, previously content just to scribble on the pages of other pirates, has decided to continue the tradition. But her extra pages have since been lost, turning up from time to time around the Sea of Thieves. 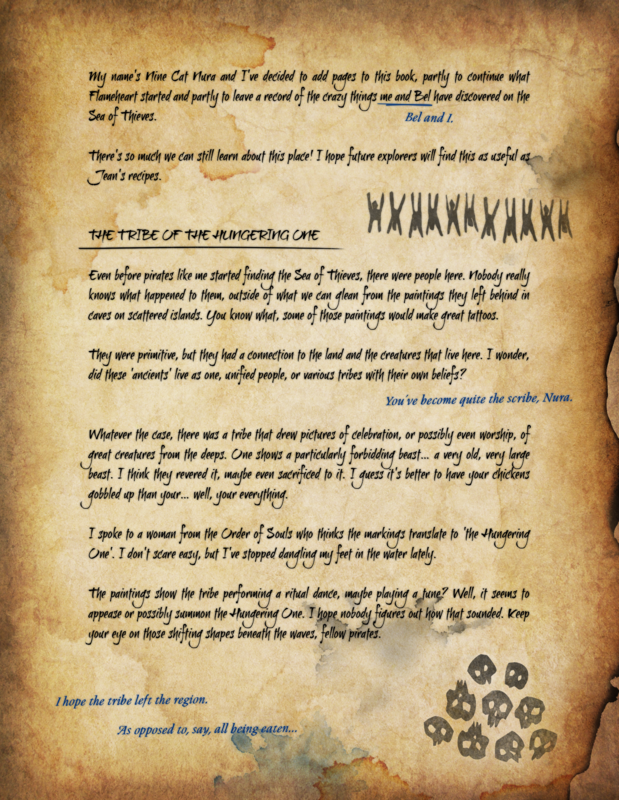 As it happened, the first of these washed up at the time of The Hungering Deep, and now a second page has been found bearing Nura's timely thoughts on the nature of curses. Curses. At their simplest, they're just bad words that make people feel bad (or have no effect at all, if you're as thick-skinned as my dear Bel). 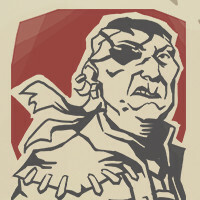 But on the Sea of Thieves, a curse is something else; a touch of darkness that twists and corrupts what it touches. After our brush with Flameheart's accursed chest, I started taking into these things more seriously. Nobody really knows the origins of curses, but it seems to me that they start when someone feels something so strong that it can't be undone. Usually it's hate, or rage, or even deep sadness. With magic being in the very air on the Sea of Thieves (so I believe anyway), sometimes these thoughts get... stuck on stuff. Like, a cherished pendant, or a weapon. A ship, even. Those with the mystical know-how can place a curse on purpose. The Order of Souls seem to think so. And maybe they'll just be a nuisance like those chests that make you feel drunk, or maybe they'll be more serious like treasure that turns your fingers gold. But now and then, they're much worse. Especially the very old ones, because like my auntie Flo, they only get meaner with time. Some curses seem to have a life of their own, spreading from thing to thing or changing the people they touch in their very soul. They can kill a person, or prevent death... or both at once, which terrifies me. That's how folks lose their minds and sure, they gain strange powers, but it's not worth it. I hope if I ever become a skelly and lose myself, my wife will come and smash my skull into smithereens. Be careful what you mess with, pirates. Don't go thinking that you can handle a curse without paying the price. 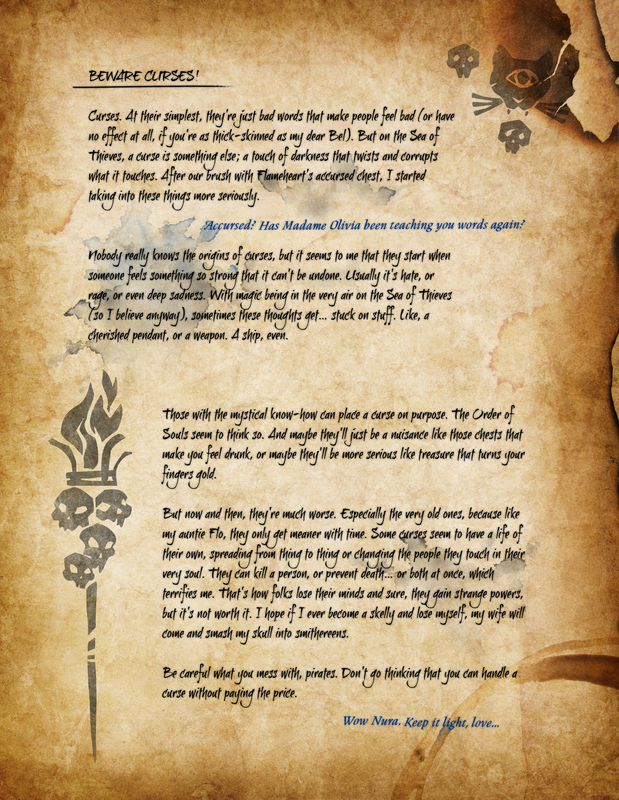 Click below to view the excerpt as a full printable bonus page for your Tales from the Sea of Thieves book!